This painting measures 26 7/8 x 28 7/8 in. (68.3 x 73.3 cm) overall. 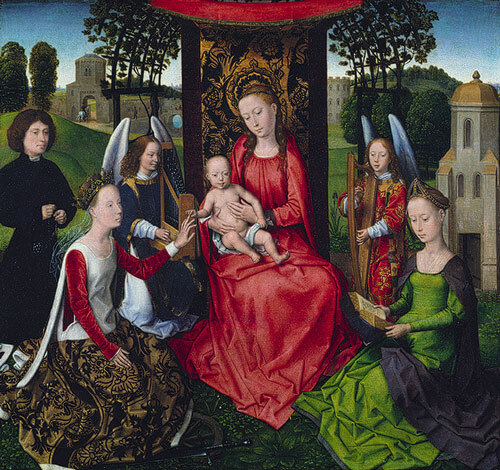 Saint Barbara is shown at the bottom right, reading, as Saint Catherine is sitting at the centre of the frame with the infant Jesus. The man at the left is depicted reciting the rosary. "Hans Memling: Virgin and Child with Saints Catherine of Alexandria and Barbara" (14.40.634) In Heilbrunn Timeline of Art History . New York: The Metropolitan Museum of Art, 2000. Overall 26 7/8 x 28 7/8 in. (68.3 x 73.3 cm); painted surface 26 3/8 x 28 3/8 in. (67 x 72.1 cm). 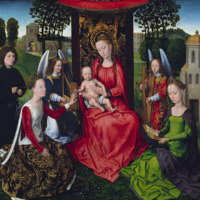 Hans Memling, “Virgin and Child with Saints Catherine of Alexandria and Barbara,” Medieval London, accessed April 22, 2019, http://medievallondon.ace.fordham.edu/items/show/28.